03/29/2019 – Executive Order 6 — Easing regulation requirements during the state of emergency for cleanup and recovery process. To appropriate money for supplemental purposes for the several departments and offices of state government. 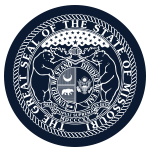 Modifies provisions relating to teacher and school employee retirement systems. Establishes a statewide STEM career awareness program and creates new provisions of law related to computer science. Appropriates money for the expenses, grants, refunds, and distributions of the State Board of Education and Department of Elementary and Secondary Education.